↑ "When humans faced extinction". BBC. 2003-06-09. สืบค้นเมื่อ 2007-01-05. ↑ 6.0 6.1 Gathorne-Hardy, F. J., and Harcourt-Smith, W. E. H., "The super-eruption of Toba, did it cause a human bottleneck? ", Journal of Human Evolution 45 (2003) 227–230. ↑ "Synonyms and Subfeatures: Toba". Global Volcanism Program. Smithsonian Institution. สืบค้นเมื่อ December 13, 2008. ↑ 10.0 10.1 "Supersized eruptions are all the rage!". USGS. April 28, 2005. ↑ Acharyya, S.K. ; Basu, P.K. (1993). "Toba ash on the South Asia and its implications for correlation of late pleistocene alluvium". Quaternary Research. 40 (1): 10–19. Bibcode:1993QuRes..40...10A. doi:10.1006/qres.1993.1051. ↑ Scrivenor, John Brooke (1931). The Geology of Malaya. London: MacMillan. OCLC 3575130. , noted by Weber. ↑ Robock, A.; C.M. Ammann; L. Oman; D. Shindell; S. Levis; G. Stenchikov (2009). "Did the Toba volcanic eruption of ~74k BP produce widespread glaciation?". Journal of Geophysical Research. 114: D10107. Bibcode:2009JGRD..11410107R. doi:10.1029/2008JD011652. ↑ Bühring, C.; Sarnthein, M.; Leg 184 Shipboard Scientific Party (2000). "Toba ash layers in the South China Sea: evidence of contrasting wind directions during eruption ca. 74 ka". Geology. 28 (3): 275–278. doi:10.1130/0091-7613(2000)028<0275:TALITS>2.3.CO;2. ↑ "Yellowstone Is a Supervolcano?". Biot Reports. Suburban Emergency Management Project (164). January 11, 2005. สืบค้นเมื่อ 2008-02-21. 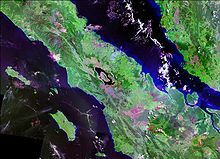 ↑ "Toba volcano (Indonesia, Sumatra)". VolcanoDiscovery.com. ↑ "Significant Earthquakes of the World". United States Geological Survey (USGS). 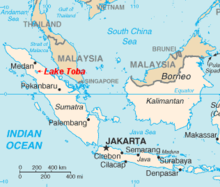 ↑ "Danau Toba (Lake Toba)". International Lake Environment Committee. ↑ Saragih, B., and S. Sunito (2001). Lake Toba: Need for an integrated management system. Lakes & Reservoirs: Research & Management 6(3): 247–251. Rampino, Michael R. and Stephen Self (1993). "Climate-volcanism feedback and the Toba eruption of 74,000 Years Ago". Quaternary Research. 40 (3): 269–280. Bibcode:1993QuRes..40..269R. doi:10.1006/qres.1993.1081. Vazquez, Jorge A. and Mary R. Reid (2004). "Probing the accumulation history of the voluminous Toba Magma". Science. 305 (5686): 991–994. Bibcode:2004Sci...305..991V. doi:10.1126/science.1096994. PMID 15310899. หน้านี้แก้ไขล่าสุดเมื่อวันที่ 11 กรกฎาคม 2561 เวลา 07:03 น.